I’m really excited to announce the new day, time and venue for The Deep End: the second Wednesday of every month from 8-11 PM at The Board Room Game Cafe, starting Wednesday April 9th! For those who don’t know, The Board Room is a LICENSED board game cafe on Barrington St. with over 400 (!) games. In addition to a bar and a cafe they also have a kitchen. As always my goal is to create a very low-key and INCLUSIVE environment, so don’t be afraid to bring people who you might not normally think to bring to a “show”: co-workers, family, etc. Here’s the first installment of the The Deep End mix sessions–something I hope to make a monthly (or at the very least, quarterly) thing. Happy Saturday all! Just a quick note to let you know that my latest Sonic State blog post is up now. It offers some tips for automating external MIDI gear in Ableton Live. 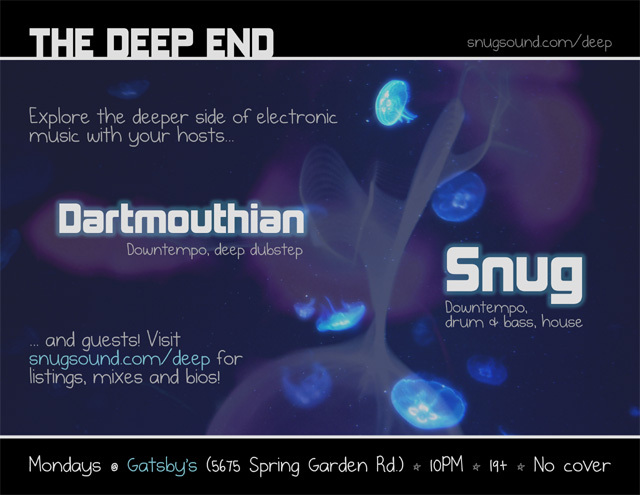 In other news, my deep/downtempo night The Deep End is back in business as of August 30th. Head on over to the Facebook page and give it a “Like” if you’re in Halifax and interested in this sort of thing. Just a quick note to let you know that I’ll be debuting my new project, Arcadia, in Halifax alongside a long overdue Snug set (probably a “deep end” set with some live improv keys). Should be a good time! 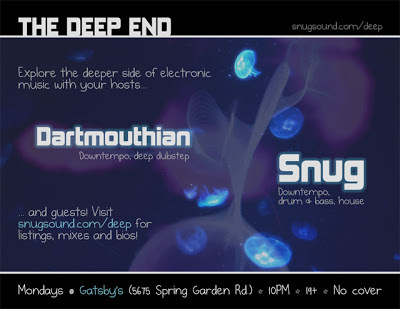 Explore the deeper side of electronic every Monday at Gatsby’s with your hosts Snug and Dartmouthian.